Prealbumin is a type of test that is carried out to find the level of protein in the diet. In reality, Prealbumin is a type of protein that is generally found in the liver. The liver produces Prealbumin in order to develop the required level of specific proteins for the body. The purpose of the Prealbumin test is to make it sure that there is no deficiency of the nutrients inside the body. Prealbumin is a type of protein that also carries the thyroid hormones. These hormones are also found in the blood. During the screening procedure adopted in Prealbumin tests in order to have an assessment of malnutrition. Like the method used in the tests, there are some predefined levels of Prealbumin. These levels are derived by the experts in order to make it sure that the problem can be identified. Some patients have the abnormal levels. These levels are compared with the normal values of Prealbumin. The levels of the protein in Prealbumin test are measured in milligrams per deciliter. The level of protein in milligrams per deciliter is different in adults and the children. There is an age consideration as well that can influence the range of the Prealbumin test. Likewise, the levels for the age range of 22 to 36 will be different than the age range of 22 to 45. The Prealbumin tests can have multiple ranges. These ranges are categorized in three forms, low, high, and Normal. After the test results, levels that are indicted can help identify the issues. Low Prealbumin range is an indication that the patient is having a liver disease. It can be due to the inflammation in the liver. Tissue necrosis is one of the indications of the disease. High Prealbumin range can be a sign that can be related to the chronic kidney disease. High range indicates that there is a long-term problem. It may be due to the steroids and alcohol use. The normal results for adults are 15 to 36 milligrams per deciliter (mg/dL). For children, the range is 6 to 21 mg/dL. 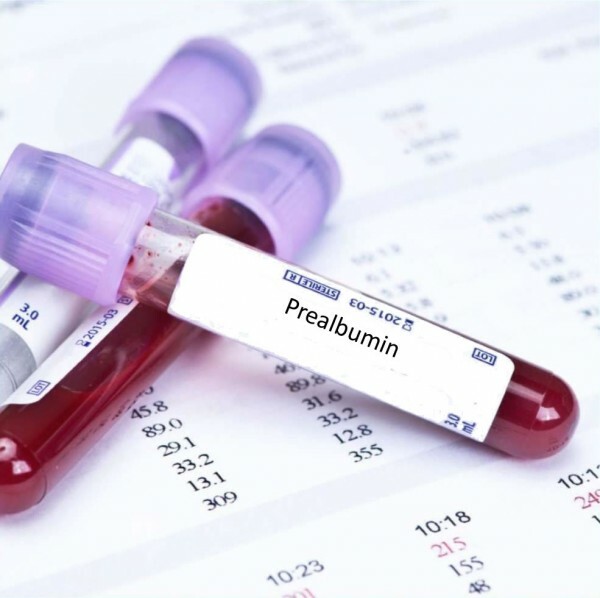 Prealbumin test is suggested to the patients that have nutritional deficiency or have low level of proteins. The test is also advised to find out if there is any infection and inflammation present. The levels of the Prealbumin is to be monitored because Prealbumin is a protein that is vital for health and is found in the blood. The presence of the Prealbumin in the blood is is necessary for many physiological process like maintaining proper osmotic pressure, proper functioning of immune system and circulatory flow. Moreover, the Prealbumin Test can also indicate that if there is any injury done to the liver because once the liver is damaged it can lower the production of Prealbumin protein. Albumi is similar type of protein indicator that is used to indicate the status of proteins in the internal organs and the blood. Let us have a comparison between the two types of the proteins. Albumin is a protein that has the longer half-life as compared to the Prealbumin. As far as the reliability is concerned, prealbumin is more reliable in having the assessment of nutritional values. The results that are associated with the level of Albumin give a long term and clear picture of the nutrition values, whereas the Prealbumin reflects the changes in the level of proteins in shorter time period.